Once recipients have opened your email they are presented with your screenshot, bio and the text comment that accompanies your video. All these factors will influence whether they click to watch the video itself. Integrating your email is also crucial for open rates if you haven't done it already. 1. Make sure you are sending from your own email address! I know we've said it before, but it really is critical as people are much more likely to engage with the content of your email if they recognise the sender, and their email address. See how here if you haven't done it yet: Integrating your email. Make sure your video is recorded somewhere well lit, and starting off with a friendly wave and smile will give you a great first screenshot to choose for the email when sending. Some of your Bonjoros may simply being looked over. Make sure you include fun thumbnails, try the "Zuza Wave" and personalise the little message (that shows in your email). More tips in our academy here. Make sure to ask the recipient to watch the video in the comment that goes with your Bonjoro. 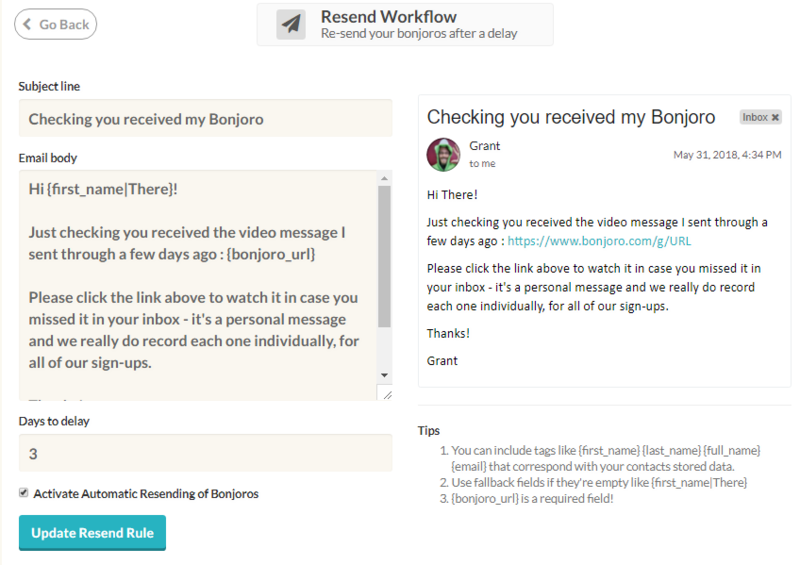 You can also use the manual 'Resend' button on individual Bonjoros from your results tab - just hover your mouse of the tile and click the resend button. Again - please make sure your email is integrated as there's not much point of setting up this workflow if you email is not delivered from your own address. What's a 'good' view rate? Looking at marketing email benchmarks the average click through rate is around 4%. The average view rate for Bonjoro is around 70%. Though of course if you are asking your recipients to take an action (click the CTA, or reply) then conversions is better comparison and the marketing email benchmark is around 1% - Our average CTA click and thank you rate is 20 to 30x this benchmark. It's worth remembering that there is no way to guarantee a 100% open and view rate - but the impact of a personal touch with the recipients that do open them. Many of our users report making back the yearly cost of Bonjoro within the first 2-3 weeks either through converting, upgrading or retaining a few additional customer. Though of course this will depend on the value of a customer to your business. Here's an example from two new customers - just skip to 16.37 on the podcast.